As I often like to point out if you are not sure which air compressor to go with, it is a wise idea to stick with well-known, reputable compressor brands. Among the brands I’ve come across, Ingersoll Rand has constantly been top of the list. 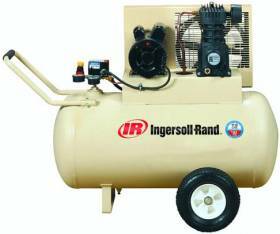 I’ve already reviewed two of their compressors, but this time around I will be talking about the Ingersoll-Rand SS3F2-GM 15 Amp 2 HP Oiled Wheeled Single Hot Dog Compressor – 30 gallon. Yeah, short and punchy isn’t it? If you are looking to buy a compressor with a “hot dog” configuration, this one should definitely be taken into consideration. Apart from being built by a reputable company, it has some great specs and all the features you might expect to find on an air compressor. This air compressor is primarily aimed at professional users and advanced DIY enthusiasts. The unit is ideal for powering impact guns, ratchets, grinders, sanders, paint guns, drills, and wrenches. The list just goes on and on. The entire unit is extremely sturdy seeing as it is made out of cast iron. Keeping up with the robust, heavy-duty approach is the oil-lubricated pump that allows for a cooler and more reliable performance. It’s fitted with a large 30-gallon tank, and is crammed full of various features like pressure switches, gauges, regulators and safety valves. The compressor is equipped with a 2.0hp motor, but more importantly it has a 100% duty cycle which is ideal for continuous use (great for any professional in need of a tool like this). The motor itself is armed with thermal overload protection which ensures a longer life and regular start-ups. If you want to check out how powerful this compressor is, the first aspects you need to consider are the air delivery rate (CFM) and the amount of pressure (PSI), and it has that in spades! It delivers compressed air at a maximum of 135 PSI, or a whopping 5.7 CFM at 90 PSI. Just to put those numbers in perspective, most power tools need somewhere between 4 and 6 CFM to function properly. In case that’s not enough, you can always rely on the massive 30-gallon tank to provide steady pressure. Oh, and the 2.0hp motor draws 15 amps. If a compressor is going to be used for any kind of heavy-duty work, it needs to be equipped with an oil-based pump which warrants cooler operation, less wear and tear, and in turn a longer life. This model features a belt drive design as opposed to direct drive where the pump is connected directly to the motor. The advantage of this approach is the pump rotates at a slower speed than the motor which puts less stress on the components and makes for more efficient operation. The pump spins at 580rpm which makes this compressor surprisingly quiet (as pointed out in numerous online user reviews). Even though it has garnered some pretty great reviews, you have to keep one thing in mind when buying this air compressor. It doesn’t come with a start-up kit so you have to buy the oil and air filter separately. It’s also important you buy the recommended kit since that’s connected to the 2 year warranty. I think this air compressor is definitely worth considering if you are a professional user. Everything about it is massive, and I am pretty sure it can rise to any kind of challenge. You can pretty much attach any type of air tool to it, and it will run smoothly and efficiently. The only thing missing is the start-up kit. With that, you can pretty much tackle any kind of job. For those among you who wish to purchase this beast, I suggest you visit Amazon and get one today.